Now includes substyle for Windows 7. Also, fixed some minor bugs here and there. The recoloring options were disabled with the WB7 beta. The only fix seemed to be to create "recoloring substyles" (labeled with a "c.") The Win7 substyle recolors fine. This theme was created specifically for my wife, Brysgirl. Pronounced "Mee-ree-claa," after a derivitave of her first and middle names put together. She had said that she could not find a theme that she REALLY liked--so I began work, and she had influence over the look and feel of each skin part. Initially, she wanted a pink theme. I thought it better for my male sanity to make a uni-color skin that could easily be recolored. With this in mind, Miricla is a theme that works well in any color setting. Just use the color adjustment tools in the WindowBlinds configuration. I am also especially happy, because this skin coincidentally was finished just in time for her birthday. Happy Birthday, Brysgirl! 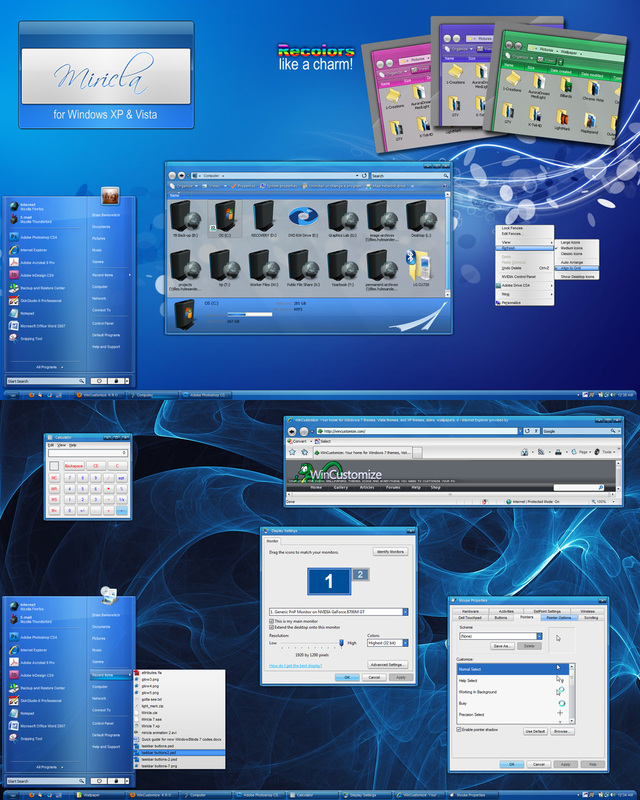 This theme was designed for Windows XP, Vista, and Windows 7. ObjectDock backgrounds and a RightClick skin will be coming soon. Also, be on the look out for a DX theme from Redneck Dude. Awesome work Brian! 5 from Me! and Happy Birthday to the Missus! Wow! It's so clean and professional looking. This is an extreme overhaul of what Windows 7 Aero Basic should look like. A 10 out of 10 for me. I've been waiting for this... Woohoo! Thanks everyone! So glad you like it! very nice and works on Windows 7 very well. thank you for your work! This is very versatile and pleasing on the eye! Excellent work! Thank you. The gloss on the buttons and bars is like candy.......yes this blind is good enough to eat!